In the PVG Belgaum premier league T 20 championship, PVG Warriors are turning out to be the favorites’ to win the cup. They won all their 6 matches will date and are on top of the points table with Belgaum Superkings behind by a single loss. The Belgaum Superkings are equally poised to win the BPL Trophy after today’s exciting win over PVG Warriors. In the Match of today with 10 Overs each, put in to bat first after losing the toss due to poor pitch conditions saw Belgaum Superkings post a total of 98 runs. 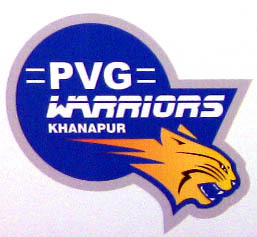 The PVG Warriors could not surpass the target and lost by 14 runs. The day saw some good batting, bowling and some catches and the winning team Belgaum Superkings’ Captain, Chetan Williams together with his boys, Raj Shanbal, Khilari, Vinu, Joshi, Imran and the others put up a very fine game. Excellent maiden over with two wickets by Shoaib Manager was the highlight of the match. The Belgaum Superkings coach Mr. Pramod Kamat and the Franchisee, Mr. Shivakumar M.D., Siddaganga Oil Extractions, have really been with the team and have nurtured them to be a cohesive group, which is very essential as the players ,we know are a mix of local Belgaum cricketing talent and other distinguished ones from Hubli and Bangalore. The Belgaum Superkings team with the support of the local and other cricket lovers will definitely perform to their best and We wish the Team a great success!